Onshore gas is extracted through wells drilled into coal seams. The initial phase of CSG production usually involves the extraction of formation water from the coal seams in order to reduce the water pressure and release gas from the coal. At the surface, water in the gas is separated and piped elsewhere for use or further treatment. Australia has relatively large supplies of CSG resources, especially in Queensland and New South Wales. CSG has been produced in Queensland from the Bowen Basin since 1997 and in the Surat Basin since 2005. Exploration has occurred in other Queensland basins, New South Wales, and other parts of Australia where there are known coal deposits. Gas from underground coal gasification (UCG) is sometimes confused with CSG. UCG is the process of gasifying coal in-situ via combustion. It transforms underground coal into synthetic gas (commonly known as syngas). Syngas consists of carbon monoxide, hydrogen and methane. Hydraulic fracturing, also commonly referred to as fraccing, is a method used by the oil and gas industry since the late 1940s to increase the rate and total amount of oil and gas extracted from reservoirs. It has been used to enhance CSG production from coal seams since the 1970s in the United States (US) and since the 1990s in Australia. Increased CSG activity, mostly in Queensland and New South Wales, has caused a parallel increase in the use of hydraulic fracturing. Although the technological aspects of hydraulic fracturing are known, the environmental impacts of hydraulic fracturing are less well characterised. The nature of an individual hydraulic fracture is complex, and depends on various factors such as the nature of land use in surrounding areas, geology, and hydrodynamics. Without the recent and significant technological advances made in drilling and hydraulic fracturing, a portion of the natural gas found in coal seams would be uneconomic and unrecoverable. Hydraulic fracturing is the most common method used to increase the production from a CSG well, but not all gas wells require hydraulic fracturing. Generally only wells that intersect lower permeability coal seams require hydraulic fracturing and these are usually deeper seams. In Australia the technique is used in approximately 20 – 40 per cent of CSG wells. Where has hydraulic fracturing been used in Australia? Hydraulic fracturing has been widely used in Australia within the geothermal and gas industries. Hydraulic fracturing for stimulation of petroleum wells, as distinct from CSG wells, has been used in most states, with the bulk of activity in South Australia and Queensland. How is hydraulic fracturing carried out in coal seam gas production? The decision to hydraulically fracture a well is often made before drilling commences because the process requires additional considerations in well design and construction procedures. Typically, a well is fully cased from top to bottom with steel casing. To gain access to the coal, the casing is perforated at specific intervals along the well, where the fracture treatment is to be carried out. Hydraulic fracturing typically involves injecting fluid made up of water, sand and chemical additives under high pressure into the cased well. 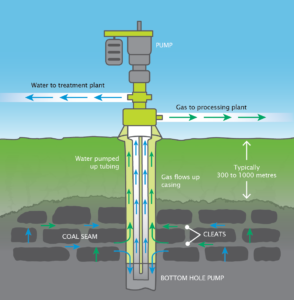 The pressure caused by the injection typically creates a fracture in the coal seam where the well is perforated. For a large CSG treatment, the fracture might typically extend to a distance of 200 to 300 metres from the well. The fractures grow slowly. For example an average velocity may be less than 10 metres per minute initially and slowing to less than one metre per minute at the end of the treatment. 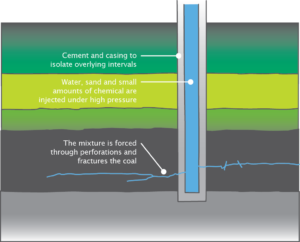 The sand in the hydraulic fracturing fluid acts to keep the fracture open after injection stops, and forms a conductive channel in the coal through which the water and gas can travel back to the well. After the fracturing is complete, most of the hydraulic fracturing fluid is, over time, brought back to the surface and treated before being used again or disposed of. What does the hydraulic fracturing fluid contain? Water (84 to 96 per cent) proppant (3 to 15 per cent), such as sand, make up around 99 per cent of the hydraulic fracturing fluid. 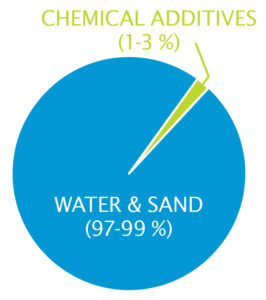 Added chemicals make up about 1 per cent of the hydraulic fracturing fluid. acids and alkalis, such as acetic acid (vinegar) and sodium carbonate (washing soda) to control the acid balance of the hydraulic fracturing fluid. Some hydraulic fracturing fluids may also contain chemicals that are not commonly associated with domestic use (e.g cyclohexylamine; Ethylene diaminetetra acetic acid tetrasodium salt [EDTA]). As with all chemicals, the extent to which these pose harm varies with their concentration and the exposure to humans. Further study is required to further quantify the human risks associated with the use of these chemicals in hydraulic fracturing solutions. The exact nature of the hydraulic fracturing mixtures used by CSG companies varies from well to well. How much water is used during the hydraulic fracturing process? In CSG developments, typically between 0.5 and 3 megalitres (ML) of water may be used to hydraulically fracture a well. A well may be fractured at different depths along the wellbore. What happens to the hydraulic fracturing fluid after it is pumped down the well? Ultimately, 30 to 60 per cent of the hydraulic fracturing fluid flows back to the well from the coal seam. These fluids are brought to the surface inside the steel casing and pumped to lined containment pits or tanks. Wherever possible, the fluid is recycled for further hydraulic fracturing treatments or taken to an off-site location to be disposed of. How deep is hydraulic fracturing performed? Hydraulic fracturing takes place hundreds of metres below ground, generally deeper than local groundwater supplies. Targeted hydraulic fracturing zones are typically located at around 300 to 1000 metres below the freshwater zones and are separated by rocks with low permeability. The fracture treatments are designed to grow only in the zone of rock that contains coal seams because growth out of zone increases the cost and reduces the effectiveness of the treatment. Each site must be characterised by measuring rock properties and stress so that the potential for fracture growth can be assessed. However, depending on the conditions at the site, some future growth in the rock around the coal can occur. Remote monitoring is used during many treatments to measure and limit this growth. What are the strategies undertaken to ensure that groundwater is not contaminated by hydraulic fracturing activities? A number of techniques are employed to reduce the contamination risks associated with hydraulic fracturing. Wells to be fractured are fully lined with steel casing, which are cemented in place to isolate aquifers overlying the target coal seam. Before hydraulic fracturing is conducted, the integrity of the cement bond between the casing and rock needs to be confirmed and verified. A wide range of geophysical techniques is used to characterise the separation of coal seams from surrounding aquifers. These include surveying, modelling and imaging. This helps to identify and avoid hydraulic fracturing operations that may cause continuity with surrounding aquifers. A similarly wide range of geological and geomechanic measurements are made to understand the properties of the coal seam and surrounding rock, to enable each hydraulic fracturing operation to be designed so that the fracture is contained within the coal seam. Monitoring methods also provide quality control on the fracture design and fracture growth, to ensure the fractures extend only in the target coal seams. The extent of fracturing can be measured at the time of hydraulic fracturing through well logging and remote monitoring such as microseismic monitoring. Tiltmeters can be used to measure the fracture orientation and volume. Offset instrumented wells are sometimes drilled and used to monitor fracture growth and are used later during production to monitor seam pore pressure. Models that predict fracture growth are used with the remote monitoring methods to assess potential risks of fracturing into zones above or below the coal seams. However, absolute guarantees about fracture growth are not possible because estimation of the growth is based on limited data reflecting the statistical variation of parameters in a sequence of rock layers. Should a hydraulic fracture grow into an aquifer the fluid flow during production will be from the aquifer towards the CSG well. This minimises the risk of groundwater contamination.